Having liver cancer has changed my life and, to an extent changed me as a person. My outlook on life, my relationships with others and my expectations about the future. I was first aware that I might have liver cancer in January 2015, when I was admitted to hospital in an emergency due to abdominal pain and jaundice. Once I had navigated my way through A&E (which took two attempts), I was seen by a fantastic consultant, Dr Moby Joseph. He arranged an urgent scan and a procedure to unblock my gall bladder. In the process, it was noted that I had a number of lesions on my liver which I was told was pretty likely to be cancer. The news was like a bomb going off…I knew it was serious but at that time didn’t know how serious or what, if anything, could be done about it. This was my first of many experiences of helplessness. I had always felt rather invincible and able to deal with anything in life but here I was at the mercy of events over which I had no control. This is a feeling I am now very familiar with and to some extent this has changed my outlook on life. It would be a while before we knew more, so armed with this devastating news, my wife Anne and I faced it head on as best we could. We didn’t have enough information to tell our children anything other than it might be serious… and neither could we be confident that it wasn’t. We decided that we would deal with it in the following way…we would assume that everything would be ok, so we played it down with our children and reassured each other regularly that it would be fine. A full diagnosis and treatment plan would take another 10 months so we maintained our positive attitude throughout as we incrementally learned more and became aware of the seriousness of it all. In between our positive moments were periods of despair. We quietly made plans for my premature death, whilst still hoping for the best. This 10 months was the most testing period of my life and yet also a period when I learned to become more accepting of uncertainty and more accepting of the possibility of death. Fear and uncertainty can be immobilizing but somehow you have to get on with life, work and relationships so there is no option but to accept how things are. In a perverse way this did me good and whilst I am fully recovered now, I have managed to hang on to a more accepting and philosophical mind-set. By November 2015 and after many trips to the QEH in Birmingham, it was established that the cancer was untreatable due to a hepatic aneurism which excluded TACE (chemo, directly applied to the tumours). The only possibility was assessment for a full liver transplant which to me seemed terribly scary. The transplant assessment happened at the end of 2015 and I was considered a good bet for transplant although there was urgency due to the continued growth of the tumours. I went on the list in mid-January 2016 and on the 16 February I got the 2am call. My surgery and recovery was uncomplicated, I was home within 8 days, and back at work in 12 weeks. There is of course the life-time need for immunosuppressants and recovery is no picnic, but a small price to pay for being given a second chance of life. So far this story is all about me, but the main players are of course, the donor and their family, the professional staff at the QEH who make everything possible, and my own lovely family. I have made contact with the donor family and exchanged letters which was quite incredible but I don’t think they will ever know just how heroic they are to have made such a difficult and selfless decision. I can never thank them adequately of course, but they are always in my thoughts and I am committed to living a good life out of respect for John, my donor and his grieving family. The staff at the QEH in Birmingham are astonishing in every regard. Without exception, their skill and professionalism is what gave Anne and I the confidence to cope with everything. In addition to this, their humanity, good humour and dedication to excellence sets them apart from anything we hear about our ailing NHS. I was fortunate to have a world class surgeon in Thamara Perera who is a truly exceptional person. I remain under their care and regularly attend outpatient appointments. I’m lucky to have a loving and close family and it is them who did the hard work, supporting, being positive and just being themselves. They were all with me at every step and again, it is one of those moments where I suddenly realised how much I take them for granted. 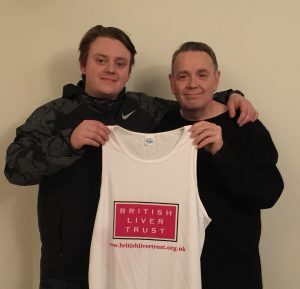 My son Lewis has been a massive support and become involved in supporting the British Liver Trust. In April 2018, he ran the London Marathon to raise money for the charity in support of all the important work they do to raise awareness and educate the public about liver health. He is not an athlete, and had only just taken up running, so this was a huge challenge for him, but he did so well and I’m so proud of him!